Entries will be open between 1st November 2018 (midnight) - 29th April 2019 (12noon), unless full prior to this. This event sold out in 2017 & 2018 with many disappointed triathletes not getting a space. Watch: Oldbury White Horse Children's Triathlon 2017. This fun run is suitable for all ages, however it is tailored towards the age 7 & under, it will take place around the school playing fields. To enter the fun run, please click here. This event distance will be 250m swim (10 lengths), 5km grass cycle (5 laps), 2.5km run (5 laps). This event distance will be 250m swim (10 lengths), 4km grass cycle (4 laps), 2.0km run (4 laps). This event distance will be 200m swim (8 lengths), 3km grass cycle (3 laps), 1.5km run (3 laps). This event distance will be 150m swim (6 lengths), 2km grass cycle (2 laps), 1.0km run (2 laps). This event distance will be 50m swim (2 lengths), 1km grass cycle (1 lap), 500m run (1 lap). In 2019 we have made the decision to reverse the running order, the older athletes will go first and the younger athletes will go last. We have done this to provide more of an atmosphere as the later finishers are coming to an end. It will also reduce waiting time for the presentations at the end of the event. If you want to take part? We also have a children's triathlon - click here. We also have a sprint triathlon - click here. We also have a sprint duathlon - click here. We also have a sprint aquabike - click here. We also have a sprint aquathlon - click here. If you wish to fundraise for this event, we are encouraging support to The Salvation Army: Recycles Swindon. As a social enterprise we create opportunities for people who have experienced homelessness to turn their lives around, recognise their full potential, learn and develop enabling them to transform their own lives. Creating new social networks and shared targets for the future, we develop a purpose in which we can work together to achieve an exciting and sustainable future for the business and the individual. Through work experience, confidence building, social activities, qualifications and skills development. Our social enterprises equip people to move forward into independent living and further opportunities within the community. Our team of volunteers have experienced homelessness and are ready to support others to turn their lives around. The Sandwich People & Recycles provides the opportunity to get involved in running a small business and gain valuable work experience in a safe environment. For more information on The Salvation Army: Recycles Swindon visit their website here. The swim will take place in the swimming pool of Calne Leisure Centre. This will be lengths of a 25 metre pool. You will start and finish at the shallow end, where you will exit through the door on the far side. Transition will be located on the playing fields just outside; you will have approximately 150 metres to your bike. The cycle route is laps (on grass) of approximately 1000 metres. You will come back into transition where you can quick change your shoes and drop your bike off, before heading out on your run, this is laps (on grass) of approximately 500 metres. As you come to the end of your final lap, you will finish on the spectator friendly cricket strip. After two successful years of this being implemented into our adult event, we will be introducing this into our 2018 Children's Triathlon. The Smart Start System works by adding a swimmer into the pool every 15-30 seconds, depending on your swim speed. This prevents congestion and also allows you to have a better swim as those in front of you have settled into their pace so there is no scrapping for the lead. This smart start system will be implemented with a snake style swim course, where each swimmer will swim up and down the lane, duck under the lane rope, and continue in each lane until they exit the pool. More importantly, this start method guarantees you start your race on the time in which you are given, no delays. Read more about our Smart Start System here. Read our visual race briefing here. You will be able to register for the event and pick up any race numbers before your start time. You will be required to show photographic identification or your confirmation email to verify whom you are when you register on the day. Race registration will be open between 13:30 and 15:00 on the day. All cycle racking is to take place on the day of the event. Only competitors will be allowed in transition and on poolside. Parents must respect this rule to prevent disqualification. Ample parking is available at Calne Leisure Centre. An overflow car park will be available on the school tennis courts, please do not park along the entrance road. Travel times by car vary, however as a guide you can get here from the following cities by google maps. The nearest motorway junction is J14-J17 on the M4. LPS Food will be serving food at Oldbury White Horse Triathlon with a range of hot food including vegetarian, vegan and gluten free options. This will be open from 13:00pm on race day. Presentations will take place at approximately 16:15 towards the end of the event once all the waves have started. Winners trophies will be awarded to the following; 1st, 2nd & 3rd male and 1st, 2nd & 3rd female overall in each race. You can enter through our website using your PayPal account or a credit card. If you require a postal entry, please contact us. Entries on the day for this event will not be accepted. A copy of the Triathlon England rulebook can be found here. We will have a Triathlon England Technical Official present on the day of the event. For your entrance fee, you will receive a bespoke medal, designed especially for this event. You will also receive a finishers memento. Electronic timing is available for the event and you will receive electronic split times for the event. You will have access to a free online training programme and also you will be part of the 2019 Oldbury White Horse Triathlon. Calne Leisure Centre lies in the heart of the Wiltshire countryside. It has fantastic and well-equipped changing and sports facilities, which include a 25m swimming pool, ideal for triathlon training. Suitable access to the sports grounds, direct from poolside, allows a great transition from swim to bike. The cycle leg takes you past Oldbury White Horse, one of the oldest in Wiltshire. Both the cycle and run route are out and back on a competitive friendly and fast course, which make it suitable for both seasoned athletes and complete beginners. 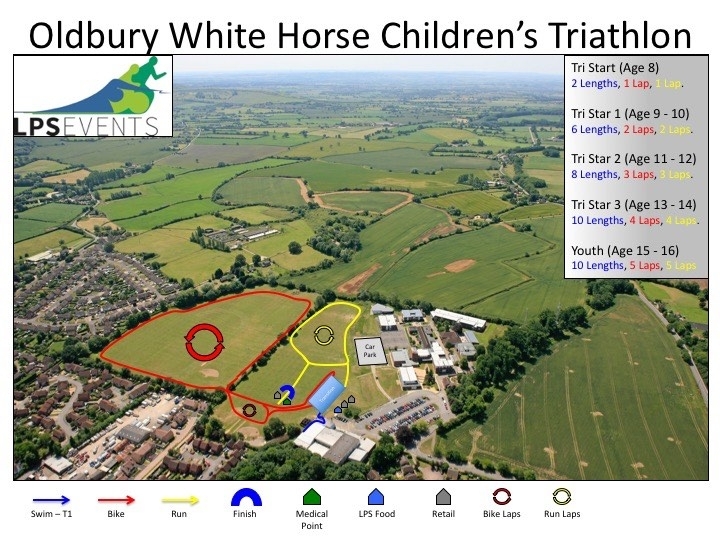 The Oldbury White Horse children’s triathlon events take place on the sports grounds making this very safe (traffic free) for children and ideal for family spectating. You should ensure that you train your body for endurance multisport events and build up your stamina. This will enhance your overall fitness. A combination of strengthened joints and also fitness will aid in your successful completion of this event and assist with your recovery after the event. As you will be mixing disciplines, we recommend that you train this way by combining your sessions back to back, especially your bike to run. This will make your triathlon experience much more enjoyable. Sprint Tri, Sprint Triathlon, Tri Events, Triathlon Events, Triathlon Event, Tri Star Tri, Tri Star Triathlon, Tri Star, Tri Stars, Triathlons, Triathlon, Wiltshire, Calne Triathlon, Calne Leisure Centre, Triathlon England.